A family friend recently gave me a LEGO-inspired gift. 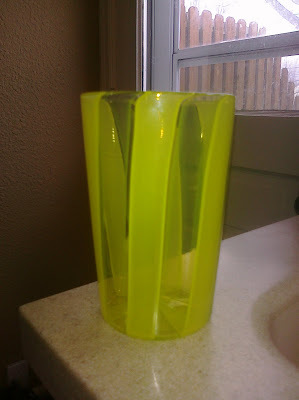 He is a glassblower and created a tumbler from two colors of glass -- one of which is the doppelganger for the translucent green windshields found in the classic Space sets. It was a nice reminder of how LEGO bricks can inspire your imagination in any number of ways. It is also fun -- if a bit embarrassing -- to make rocket ship noises while drinking iced tea. Everything is more fun with rocket ship noises, if you need corroboration of that fact, I shall refer you to my infant daughter.